Who's No. 1? 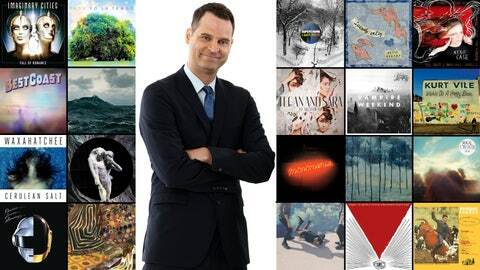 Jay Onrait breaks down his favorite albums of the year. The US and Canada share more than the longest undefended border in the world. We share a love of contemporary music. How else can you explain the popularity of Michael Bolton on both sides of the 49th parallel? Therefore my move to FOX Sports 1 will not deter my friend Dave Hodge and I from continuing our annually tolerated list of our Top 20 Albums of the Year. In fact, the list is now a shining example of how two nations can work together: It will appear on TSN.ca in Canada and FOXSports.com in the United States. I haven’t seen this spirit of cooperation since Canada reluctantly agreed to let Randy Quaid hide out from US authorities in British Columbia. 1. Vampire Weekend — "Modern Vampires in the City" … I got this album and listened to it once and enjoyed it, and then my friend Pat Thornton of pats24hrs.com fame sent out a tweet that said it was easily their greatest album, and then I replied and said, "Yeah, I think it is a great album," and then he said, "NO, IT’S THE GREATEST!" but he didn’t shout because Pat is a gentle man. Bottom line: This is the greatest album this band has put out, a modern classic, and the album of the year for 2013. Pat said so. 2. Foxygen – "We Are the 21st Century Ambassadors of Peace and Magic" … I bought it on recommendation from a friend, gave it a listen and I haven’t stopped listening since. Sounds like something that could have come out between "If You Believe Your Eyes and Ears" by the Mamas and the Papas and "John The Wolfking of LA" by John Phillips in the late 60’s. Every track is a winner. 3. Kurt Vile — "Wakin’ on a Pretty Daze" … This is one of those guys who always sounds like he is stoned but insists in every single interview he is NOT stoned even though he can’t really get his words out properly and the title of the album is kind of a giveaway. You don’t need to be stoned to enjoy it. The songs are long and flowing and full of loopy guitars and … never mind. 4. Deerhunter — "Monomania" … Their last album was my favourite record of 2010 ("Halcyon Digest"), and when I first heard this one I thought, "Oh crap, they’ve screwed it up this time." But as usual I was wrong. Bradford Cox is a little like the Prince of the indie-rock world, recording more material than he can possibly put out and probably storing it somewhere in his purple-coloured mansion for release upon his death. And by "purple-coloured mansion," I mean his apartment because no one is making money from music anymore. 5. Superchunk — "I Hate Music" … These guys are OLD and they keep putting out great record after great record. It’s like the opposite of The Killers. 6. Yo La Tengo — "Fade" … See No. 5. 7. Arcade Fire — "Reflektor" … I have to admit I thought they had gone a little overboard with that special after their Saturday Night Live appearance where Michael Cera was speaking Spanish, and then I thought they had gone a little overboard when they asked all their fans to put on suits and dresses for their concerts, and then I listened to the record. It’s really good. James Murphy from LCD Soundsystem handles a lot of the production. I love Regine Chassagne’s voice. They might be the biggest band in the world and they’re based in Montreal. I guess I can put on a suit for that. 8. Daft Punk — "Random Access Memories" … When I first moved to L.A., I would leave work at night and put this album on in my car and listen to the first track "Give Life Back To Music" while cruising down the 10 on the way home and it felt very "L.A." Then I would shut the song off and "Hollywood Nights" by Bob Seger would come on the radio and it felt even more L.A. Then I would get stuck in traffic. 9. Imaginary Cities — "Fall of Romance" … When I was living in Winnipeg, I asked a guy why so many amazing musicians come from that city — Neil Young, The Guess Who, Weakerthans, the list goes on and on. His theory was as follows: If you are a city that is blisteringly cold and covered in snow for at least half the year, you do a lot of drugs and learn to play instruments. I think that may be over-simplifying it a bit, but these guys opened for the Pixies. 10. Neko Case – "The Worse Things Get" … Neko has a very interesting and vulnerable Twitter feed. She is very real and honest about her fears and hopes and loneliness. She also happens to have one of the greatest voices in music today. 11. Best Coast — "Fade Away EP … Speaking of great voices and great social media feeds, Best Coast lead singer and songwriter Bethany Cosentino recently sent out an Instagram pic of Peg Bundy and Kelly Bundy from "Married With Children" in which they said, "I want to do nothing. I want to be nothing," and she said, "Exactly." She is also obsessed with Seinfeld. Basically she is perfection. 12. Speedy Ortiz — "Major Arcana" … You had me at "sounds like early 90’s indie rock." 13. Ty Segall – "Sleeper" … This is a pretty mellow effort from a guy who puts out an album a year. Sometimes three. Having said that (as Larry David would say), this might be his best. 14. Parquet Courts — "Light Up Gold" … See No. 12. 15. Mikal Cronin – "MCII" … This guy plays bass and sings in Ty Segall’s backup band, and Ty Segall is pretty much constantly touring so it must have been tough to find the time to record this album. But thank God he did! It sounds like modern day Matthew Sweet! 16. Waxahatchee – "Cerulean Salt" … And this one sounds like modern day PJ Harvey! All the songs are amazing. This is the kind of album you should buy for that mysterious and somewhat standoffish girl at work you’re trying to court but she clearly thinks you’re an idiot. This will show her. This will show her you ARE an idiot but you have good taste in music. 17. Volcano Choir — "Repave" … Bon Iver guy Justin Vernon’s other group. If I told you this was the new Bon Iver album you would just shrug and say, "Sounds pretty good! When is he on SNL again, and is he bringing that big guy who plays the chimes and trombone?" or something to that effect. 18. Brendan Canning — "You Gots 2 Chill" … I saw Brendan recently and forgot to ask him this: Was the title of this album some motivational message he wrote himself on a Post-It note that he stuck on the fridge one night after he got a bit too passionate during a drunken argument with friends? I’ll bet it was. Not that I’m speaking from experience or anything (I’m speaking from experience). Perfect Sunday morning record. Also you’re supporting a hard-working Canadian artist here, so get the vinyl! 18. Tegan and Sara — "Heartthrob" … I remember when I was hosting The Big Breakfast in Winnipeg and our Producer had just come from The Big Breakfast in Calgary and she told us they would have Tegan and Sara on the show all the time because they were born and raised in Calgary. I really loved Tegan and Sara and hoped we might get them to appear on our show as well. That never happened because they became huge stars. I couldn’t have been happier for them, but I really think they would have liked our coffee. 19. (tie) Local Natives – "Hummingbird"/Camera Obscura — "Desire Lines" … Good, but I was expecting better. Like Larry David’s "Clear History" or "Man of Steel" or "Hooters Restaurant." 20. My Bloody Valentine – "mbv" … Like the opposite of "Chinese Democracy."